LONDON—16 October, 2018 —Amazon today announced an initiative to generate renewable energy by installing solar panels on its fulfilment centres across the UK, with an installed capacity of 20 megawatts. Amazon expects the solar panels to generate the equivalent amount of electricity required to power over 4,500 UK homes and will reduce its carbon footprint by 6,000 tonnes of CO2 annually. The solar systems will be developed and funded by Macquarie Principal Finance. The company plans to initially deploy large-scale rooftop solar systems on 10 of its fulfilment centres in the UK over the coming 18 months, subject to planning and landlord approval. This is part of Amazon's commitment announced last year to deploy solar systems on 50 customer fulfilment centres globally by 2020. For details and a video of a similar project in North America, visit www.amazon.com/sustainability. Amazon has also signed a deal for 100% renewable electricity to power its UK buildings. The electricity will be fully backed by Renewable Energy Guarantee of Origin certificates (REGOs) and means the energy it buys for its fulfilment centres and other buildings will have been generated from renewable sources such as solar or wind. "As our fulfilment network continues to expand, we want to help generate more renewable energy at both existing and new facilities around the world in partnership with community and business leaders," said Stefano Perego, Operations Director for Amazon UK. "We are putting our scale and inventive culture to work on sustainability, which is good for the environment, our business, our customers, and the communities in which we operate. By diversifying our energy portfolio, we can keep business costs low and pass along further savings to customers." 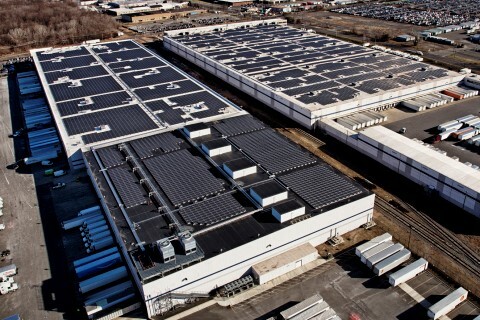 In addition, Amazon will install battery systems at a number of its fulfilment centres to participate in energy demand management, frequency control, and load management programs in coordination with local distribution network operations and the National Grid. At those sites, the batteries will be charged at times of low demand (for example, overnight) and use it to power its buildings when commercial and consumer use is highest. This helps ensure that the grid can meet customer energy demands at peak times. Claire Perry, Minister for Energy and Clean Growth, said: "The UK has led the world in cutting emissions whilst growing our economy - with clean growth driving incredible innovation and creating hundreds of thousands of high quality jobs. Ten years on from the Climate Change Act, the first ever Green GB week is a time to build on our successes and explain the huge opportunities for business and young people of a cleaner economy. I'm delighted to see how many more businesses and organisations such as Amazon are seizing this multi-billion pound opportunity to energize their communities to tackle the very serious threat of climate change." Aerial view of two Amazon fulfilment facilities with solar systems on their rooftops. Photo credit: P2 Photography. To learn more about Amazon's sustainability initiatives, visit www.amazon.com/sustainability.